China calls it the project of the century – a massive roll-out of Chinese-built infrastructure to remake the map of the global economy with China at its heart. Wu Xiaodong remembers the day he joined the railway. It was 1983. China had a mere 1% of world trade and, aged 17, his own ambitions went no further than a free uniform and a free train ride. Biblically, I do not believe that it will take a century to see the significance of the Silk Road project, which is also called the One Belt, One Road project. During talks with Chinese President Xi Jinping on the fringes of the recent G20 summit in Hamburg, Japanese Prime Minister Shinzo Abe expressed Tokyo’s intention to participate in Beijing’s ambitious “One Belt, One Road” economic plan, a significant concession from a government that had previously distanced itself from Chinese economic and development initiatives. Analysts say that while the Japanese leader is hoping for a windfall for domestic companies, he also recognizes that Japan simply cannot afford to be left out of a growing international project without any say in its future direction. Yet another motivation is to pressure President Donald Trump’s administration to re-engage with its longstanding allies in the Asia-Pacific region instead of permitting China to seize the initiative. 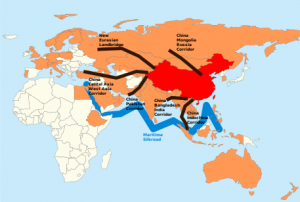 “The ‘One Belt, One Road’ scheme is a cause for concern for Japan on several levels,” said Stephen Nagy, a senior associate professor of international relations at Tokyo’s International Christian University. “Tokyo is sending a signal to Washington that it is willing and able to diversify its relationships in the region and that it is not relying solely on the US any more,” Nagy said. He pointed out that Washington downgrading its role and commitment to the region benefits neither the US nor most of the Asia-Pacific region, although China and North Korea would almost certainly welcome Washington’s retreat. “This withdrawal of the US from Asia is a real problem for Japan, for economic and security reasons,” said Robert Dujarric, director of the Institute of Contemporary Asian Studies at the Tokyo campus of Temple University. “Japan feels that it has been stabbed in the back by the US pulling out of the Trans-Pacific Partnership free trade deal and it is exploring other options,” he said. “And most other countries in the region would far rather that Japan and China be on good terms because no one wants more chaos. China’s ambitions are immense. It intends to build roads to the Middle East and elsewhere. The ‘Silk Road’ project of China expects to increase China’s influence in Asia, the Middle East, Europe, and even Africa. The picture at the beginning of this post shows several proposed corridors for the One Belt, One Road (yes, there are more than one)–where, in a sense, all roads lead to China (China is shown in red). The countries shown in orange are all members of China’s Asian Infrastructure Investment Bank (AIIB). The corridors shown in black are primarily land routes, while the blue is over the seas. Only China and others in Asia are capable of producing an army of that size. Roads to Armageddon will be built (a related video is available: Is China paving roads to Armageddon?). So, China has to be careful. It is likely to have unrest, even though it is getting wealthier. The 21st century will not be “China’s century” as some have claimed. China has a lot of real problems. With the economy slowing back home, state construction companies are being put to work abroad, their projects backed by state loans. Although China says its plans are for the benefit of all, most jobs here will go to Chinese workers, and the loan that secured the contract – for nearly $2bn – was tied to a Chinese design. Some believe that this project will give China a major debt problem that will harm it (see Will debt derail China and its ‘One Belt, One Road’ plan?). And that may well be the case. The Bible tells of a time when the “kings of the sunrise” (literal translation of Revelation 16:12) will get together. That would include China and Japan (as well as Korea and others). They will travel towards the west. They will travel on land, sea, and probably some via air. Land and even sea routes are planned by the Silk Road project. Yet, some of what China is starting to build will be used by troops that will ultimately gather in Armageddon. Korea in Prophecy, Any Witness? Where did the Korean people come from? Does God have a plan for the Koreans? Is Korea mentioned in any prophecies? Will Koreans be among the first in the Kingdom of God? Here is a machine-translated link to that article in Korean: 한국의 언어로 : 한국 예언, 모든 증인에? ; here is a link to that article in Mandarin Chinese: W(˜„ŠN-v„—éVýÿg NûOU‹ÁNºTÿ. A prophetic video is also available: Syria, North Korea, and Prophecy. This entry was posted on Saturday, July 15th, 2017 at 7:30 am	and is filed under Prophecy.